What happens if you have some broken domes sitting around, too much free time, and a hack saw? You can hack domes. Carefully them apart at the base with a saw. Stuff them with new parts or mix them up. Sand the cut edges smooth and put it all back together with model airplane glue. The dome is still drab. It illustrates the dichotomy that is tearing the snowdome world apart. On the one hand, it's a classic with four, count them, four separate plastic panels. You get the teeter tooter, the name plate, a tall ship in back, and a state map. It's jam packed full of good stuff. I can't even see the map! But what about the color? I know China has air pollution, but did all the white plastic turn black? This was my first dome transplant. . I swapped the base and the shell with an old white Xmas dome. Now the only dichotomy is the teeter totter. That crab is still too heavy. I should have trimmed some fat off it while everything was opened up. 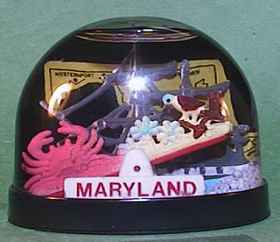 After I glued the Maryland dome back together and found that it didn't leak, I was elevated to a new level of consciousness. Now I could be a snowdome king No longer would I have to be content with shot glasses and float pens. I could just manufacture my own. I learned it's not that easy. Snowdomes are like pies. You have to have good fillers. 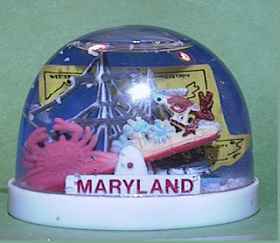 Here's some early shots fired against those lucite domes. 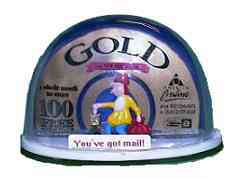 Here's a use for those AOL CD's. Shake this one and you get 100 free hours of snow. After that, it's a nickel a minute. 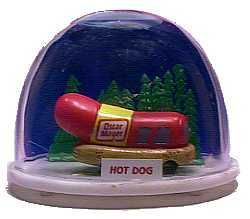 When I was small, my brother and I spotted the Oscar Mayer Weinermobile rolling thru town. We were so excited, but no one believed we saw it. Many years later, a sleazy outfit took over the company I had been working for. They offered me a bonus to stay but I still quit for another job down the street. A week into my new job, the corporate e-mail said the Weinermobile would be stopping in our parking lot! I was first in line to meet the hot dog ambassadors and get the whistle you see here in the dome. Little Oscar drove his truck past my previous company without stopping, just like every one else. My ex-employer went bankrupt in a year. The miata came out right about the time of the above job crisis. I did buy a car that year, but it was a minivan, which I really enjoyed. 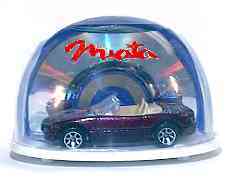 We drove it coast to coast in the USA and used it to get many of the snowdomes on my web site.
. My good friend bought one of the first miatas though. He came over to show it off and let me drive it. I promptly missed a shift and crunched his gears. No permanent damge, but I knew it must have hurt him mentaly. Four years later, I bought one and gave him a chance to pay me back, but he was nice. I stuck in a toy car, but the overall effect wasn't tacky enough. I expected the metal car to rust.. .